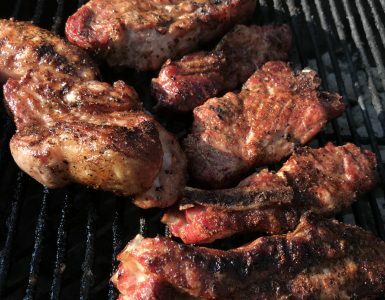 When grilling on the go, whether a gameday outing or campout, it’s hard to beat the prep ease and tastiness of a blackened steak and some spicy fixings. We are sometimes asked to take a look at a product and give our honest opinions on it. 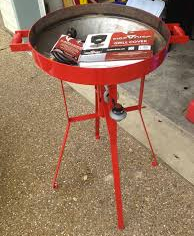 The folks at FireDisc Grills asked us to take a look at their FireDisc … we were happy to oblige. The setup is a breeze and takes less than 30 seconds. Because it breaks down into three pieces, it’s very portable and perfect for a tailgate, camping trip, beach trip or just a quick dinner in the backyard. 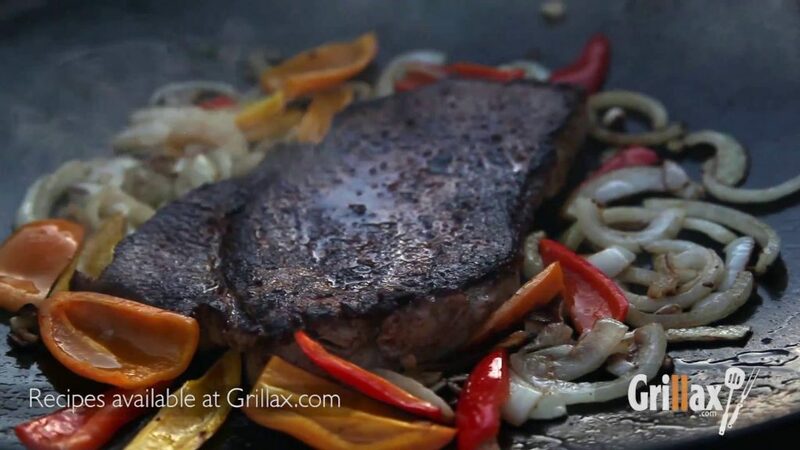 The Grillax pro staff took the FireDisc on a camp-out retreat and put together a Blackened Steak dish, complete with sautéed peppers and onions. Oh. My. Gah! Was it ever good! With an easy-to-create blackening seasoning (see below), or a store bought version, this steak recipe should be on everyone’s next menu for their next big outing. 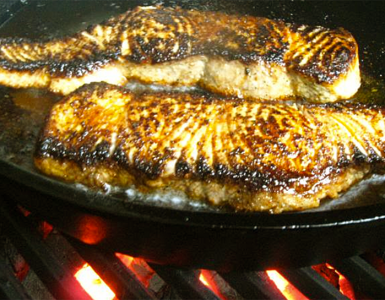 As with any blackened recipe, you need high heat to sear the seasoning to the meat, and the FireDisc doesn’t disappoint. 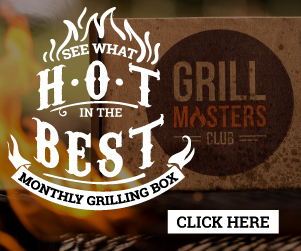 On high heat, the FireDisc creates high temps on the cooking surface in mere seconds, with the unit rising to optimum temperature and ready to cook most dishes in less than a minute. 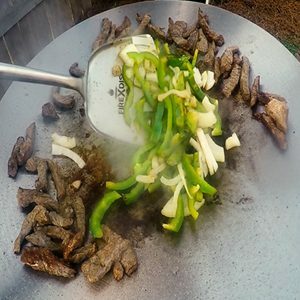 We were quickly cooking up our peppers and onions in a tablespoon or so of olive oil, and because the cooking surface has a rounded bottom, similar to a wok, it’s easy to cook delicate veggies and move them up the side of the disc and continue cooking while the veggies warm. The vegetables, combined with the spicy sear of the steak, created an outstanding combination of flavors that would make the most finicky of palates smile with delight. We can’t wait to try out more dishes with the FireDisc. Combine paprika, cumin, garlic powder, onion powder, oregano, salt, and pepper in a small bowl. Brush olive oil evenly over steak. Add the rub to both sides of the steak, pressing to adhere. Place in the center of the disc and sear the steak for four minutes per side.. Remove and let stand 15 minutes before thinly slicing. Cooking for loved ones is fun and exciting, and this Thai Basil Beef recipe is sure to please that special person in your life.